Irish Butterflies - Butterfly Species - Small Butterflies. 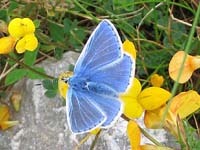 There are several Irish butterflies that are quite small in size (wingspan of less than 1.5 inches (38mm)). There are three sub-families of these group: Blues, Hairstreaks and Coppers. Another unrelated group, the Skippers is included here as these are also quite small in size. Click on the species name for full details.